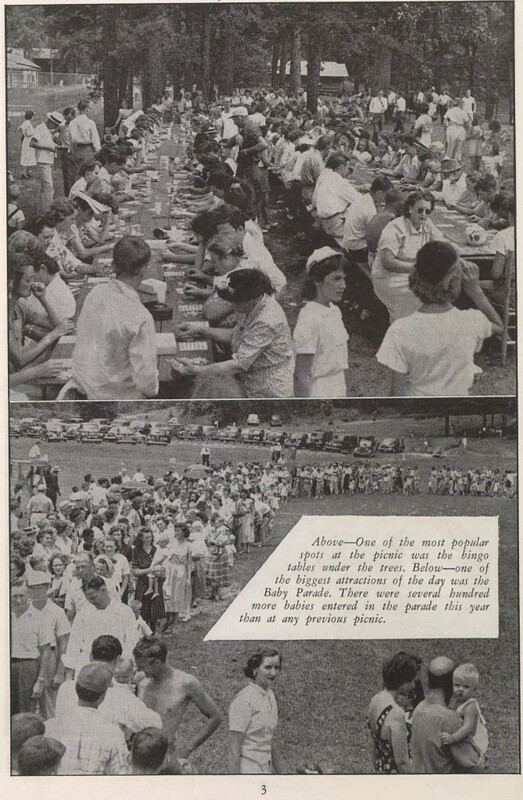 This image from the July 1949 issue shows a company picnic. There were separate bingo tables for white and black employees. 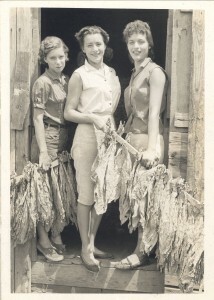 The mill flourished during World War II and beyond, quickly diversifying beyond cigarette papers to writing paper and other flax-based products, eventually moving on to plastics and cellophane. It operated as a mill, under various owners, until it closed 2002. The Echo was a monthly newspaper produced by the mill from 1940-1954. Like other mill papers from small towns (like the Badin Bulletin and the Chatham Blanketeer) The Echo not only describes events at the company but also documents the lives of its employees and the surrounding towns. Each mill department gets its own column, in which employees’ vacations, illnesses, social exploits, and private jokes are described in great detail. 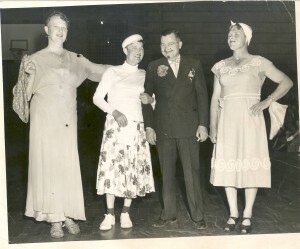 A typical paper from the 1940s shows photos of the many recreational activities provided at Ecusta (square dancing, baseball, and dramatic clubs) right after the “Safety Page,” which educates employees on mill safety procedures as well as accident statistics. The paper changed physical format a bit in its later years, and included a lot more photos. However the details of employees’ family lives remains central. The final issue states that the company paper changed to the Olin Mathieson News in 1955, after the Olin Mathieson Chemical Corporation, the current company owner. The Echo is available online in partnership with the Transylvania County Library. 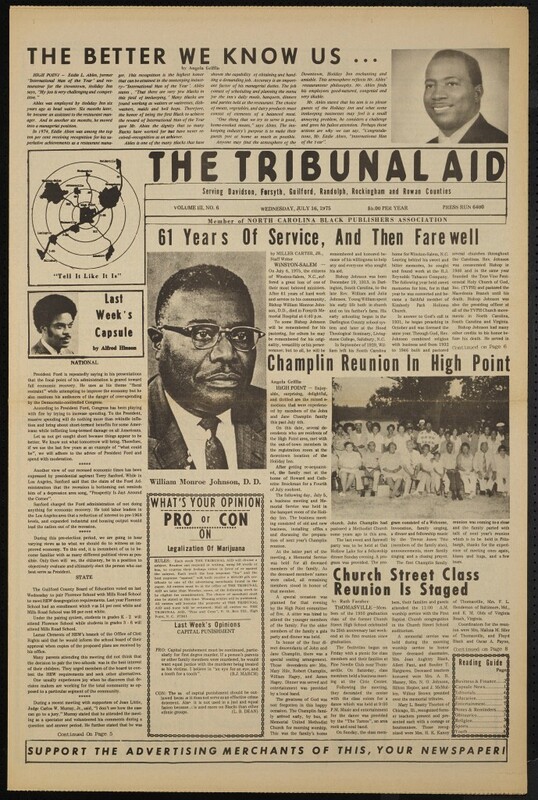 These are the goals and aspirations of The Tribunal Aid, stated above the masthead in its very first issue. In partnership with the High Point Museum and the paper’s publisher, the entire run of this newspaper, which documented the African American community from 1973-1976, is now available on DigitalNC. The Tribunal Aid really ranges from the very local to the broad in scope. The paper solicited submissions from High Point and surrounding areas, and is a rich source of local information about events as well as personal milestones (marriages and births, for example). There’s quite a bit of information from Historically Black Colleges and Universities (Livingstone, North Carolina A&T University, and Winston-Salem State University). On a national and state level you’ll find coverage of well-known news items of the 1970s, like the Nixon impeachment, America’s Bicentennial, and North Carolina’s Eugenics Commission. One of the hallmarks of this paper is its ongoing and rigorous efforts at getting its readership engaged. There are a number of recurring editorials like “The Point Is…” and “To Be Equal,” which argue for free expression as well as active participation in political and community affairs; editorials are shared under the tagline “You’re a part of the solution, or you’re a part of the problem.” Another regular feature throughout 1975-1976 is “The Better We Know Us…” biographies of local African Americans that appear above the masthead and which helped describe African American citizens having an impact on local life. Some issues of the paper have Pro / Con polls, asking readers to weigh in on topics that are still weighty today, like legalization of marijuana (see right) and capital punishment. This paper joins a growing collection of items related to the history of High Point, shared by the High Point Museum as well as other institutions in that city. You can view them all here. Over 160 additional photos from Edgecombe County Memorial Library’s M. S. Brown Collection have just been added. 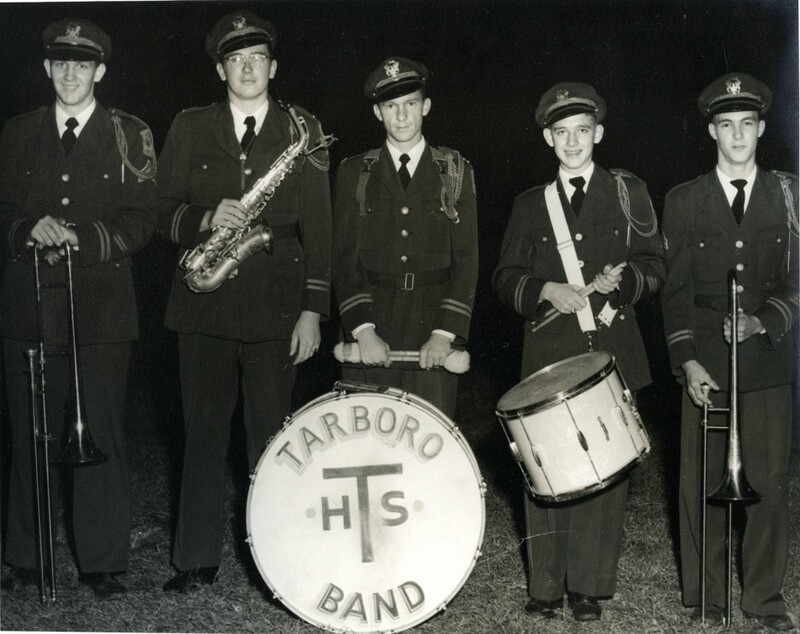 This batch features many photos of the Tarboro High School band and majorettes, along with photos of local social functions, Tarboro homes and businesses, and, of course, the community pool. 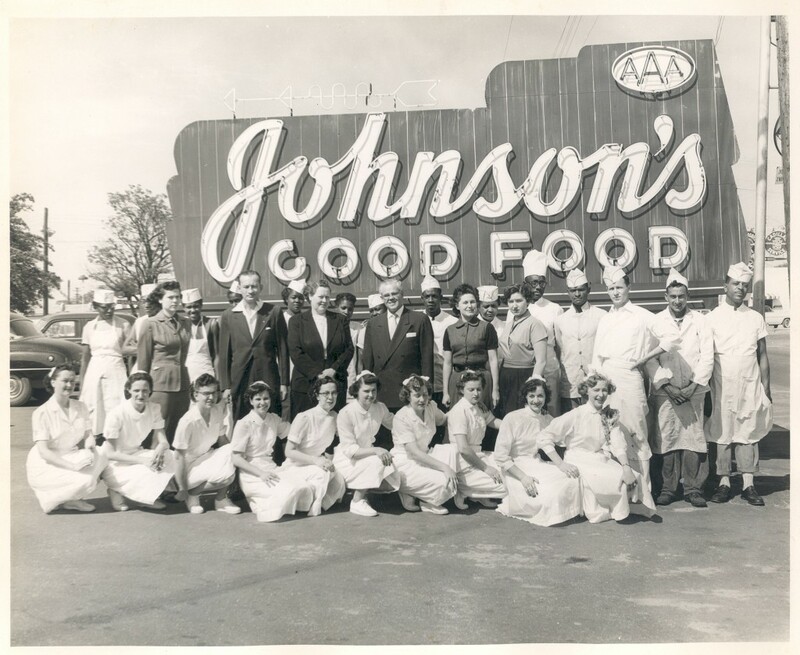 M. S. Brown owned a Coca-Cola bottling plant and was an avid photographer of Tarboro and the surrounding areas. This latest group of photos joins several hundred already on our site. You can learn more about M. S. Brown in a previous blog post. Yearbooks and other Edgecombe County Memorial Library items on DigitalNC can be seen via their contributors page. 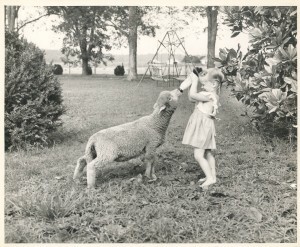 We’ve just added scrapbooks, a town ledger, and several additional yearbooks from Rockingham County Public Library, part of the collaborative Rockingham County Legacy project. Two Rockingham County Library programs from the 1970s are documented in these digitized scrapbooks. The Drop-in-Library (DIL) was a grant-funded initiative to bring resources, especially audio-visual ones, to children who couldn’t get to a physical library branch. The DIL van “dropped in” to residential areas, head start programs, day cares, schools, and other parts of the community, where staff would present filmstrips, read books, and provide the children with a variety of activities. The scrapbooks include newspaper articles, promotional materials, and documentation about the program, as well as photographs showing children taking advantage of the DILmobile’s resources. The Special Outreach Services (SOS) program similarly offered services to those who had trouble getting to a branch. 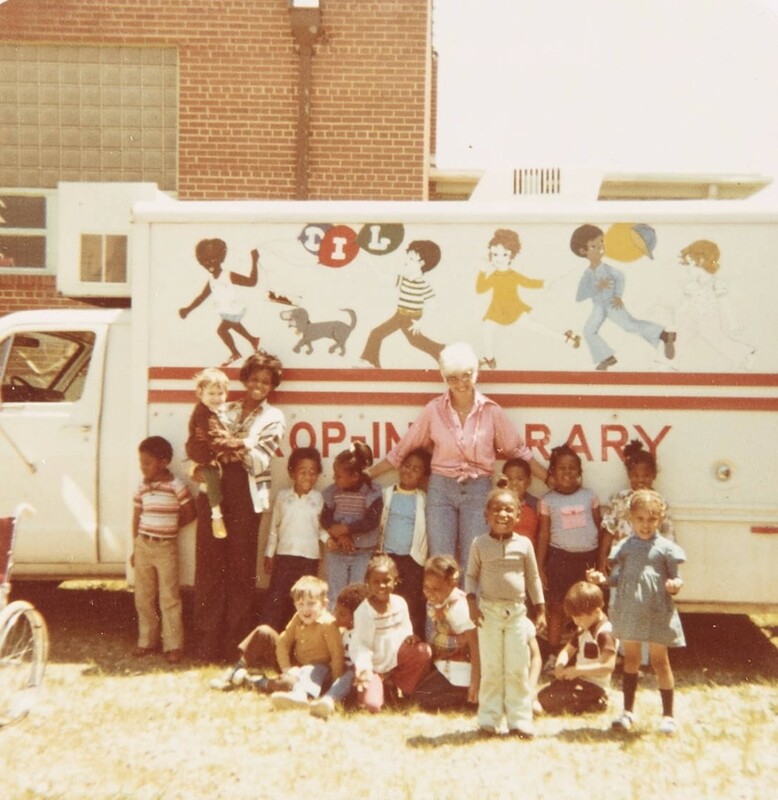 This service delivered large print books and other materials via station wagon to the homebound. This most recent batch also includes a Property Tax Register from the town of Madison, as well as more yearbooks for Booker T. Washington High School, John Motley Morehead High School, and Stoneville High School. There are now over 120 yearbooks from Rockingham County institutions available on DigitalNC. Working closely with staff at Harnett County Public Library, we’re pleased to announce migration of over 1100 images from their Digital Database to DigitalNC. This collection shows a wealth of activities, events, people, and places in Harnett County. North Carolinians of note can be found in this collection–Governors Kerr Scott and Luther Hodges, Paul Green, Susie Sharp–however more striking are the number of identified general citizens of Harnett County. Portraits are an overwhelming part of this collection, with photos of school sports groups, community groups, individuals, wedding portraits, and groups of folks posing at all manner of local events. This was the first migration of this type for us, and we were glad to work with our partners to move their content to a new home. We’re also pleased that this well-documented collection of Harnett County’s history can now be searched alongside the thousands of other images available through the Images of North Carolina collection on DigitalNC. *Information provided by Harnett County Public Library.